The Psychogenealogist Pic of the Week (#99) - Is This the Family of Moses Devore (1844-1917)? 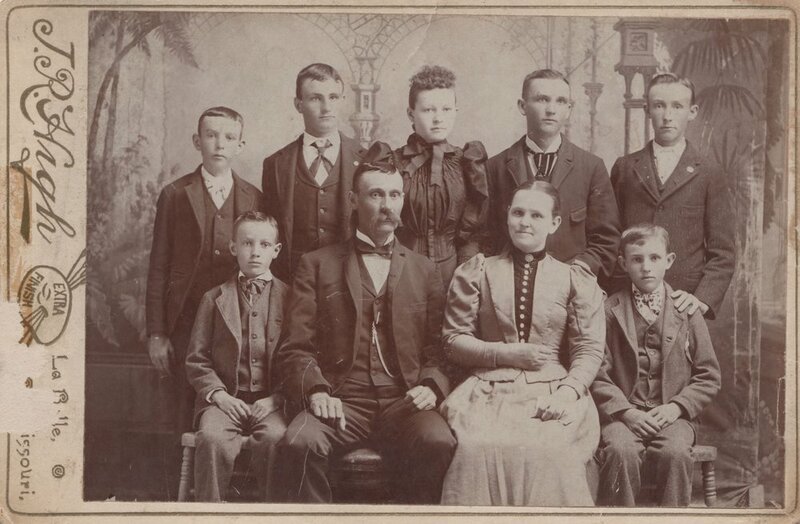 Here is a lovely family portrait cabinet card, probably from the late 1800s or early 1900s. It appears to be a mother and father with six sons and one daughter. The photography studio name is “J.R. High” of La Belle, Missouri. There are some notations on the back as well, written much later. There is a sticker on the back that says “Gerald Sargent” and a stamp from Owen Co. Kentucky. It appears to be some sort of inventory stamp. I am thinking that this photograph has been bought and sold a few times from and to collectors like myself. I purchased this photograph from eBay. There are several family tress on Ancestry, some public others private, that appear to include this family. There are even a few photographs that bear a likeness to the individuals in this photo. If someone had the time and felt so inclined I feel like there is a good chance of getting this photograph in the hands of a descendant of Moses and Fannie. Who are the Devores and what are their stories? Which of the children are in this photograph and what year was it take? Can you help me find any descendants of Moses and Fannie who might be interested in having this photograph in their collection? What do you think, feel, and wonder about as you look at this family? How did the photo end up being sold in an eBay auction? Can you tell me anything about the photographer? A lovely family portrait, this cabinet card appears to be the family of Moses (1844-1917) and Fannie Raisor Devore (1855-1926). Can you help me find and tell their story?